It’s Perfect Picture Book Friday, practically Easter, and soon-to-be April! I have a tons-of-fun book to share today that I hope you’ll all love! Why I Like This Book: This is a delightful story, told completely through dialogue and illustration (a good mentor text for writers who are working on similar stories.) The writing is spare and there is no written narrative – it’s all a conversation. The girl is completely sure that her idea is best, her game the most fun…and not surprisingly it gives her the starring role. The boy is equally convinced that his totally different idea is best, his game the most fun…and not surprisingly it gives him the starring role 🙂 Anyone who has ever spent time around kids will recognize this dynamic. The children’s imaginative descriptions grow more and more elaborate as they try to convince each other, but it is not to be. Before long the girl is playing her game, and the boy is playing his. But they are side by side… sneaking glances at each other… ultimately unable to resist their curiosity about each other’s games and the allure of having someone to play with, not just next to. The resolution is just right – very believable – and brings young readers full circle. But one of the best things about this book is the art! Childlike crayon drawings depicting the imagined games – SO much fun, and not to be missed! Have a wonderful weekend, everyone!!! 🙂 And Happy Easter and Happy Passover to all who celebrate! 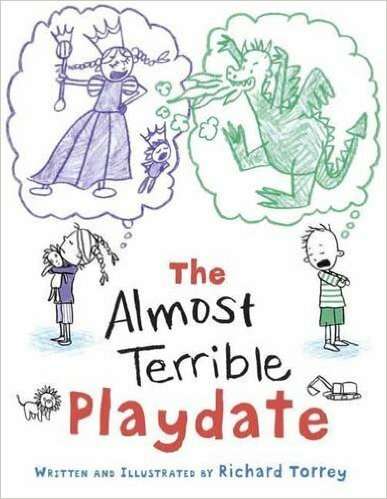 Such an important topic for children learning to play together and compromising. I like that both siblings have their own ideas about playing, but are curious about each other. Love the cover! Also meant to give you kudos for finding the time to update the PPFB list. Monumental task. I have a book I would like added that may have fallen under your older website. The author has contacted me. Wish it was an easier job. Can’t imagine doing it manually! You are remarkable. thanks for the chocolate bunnies! And the fun story. I love imagination and kids and their different ideas of what they could do together. I’m intrigued! This book sounds like a great one to pair with SAM & EVA by Debbie Ridpath Ohi. Thanks for your hard work on updating the list!! Cute story and interesting the way it’s written. Have a great Easter. Happy Easter, Susanna. What a wonderful all-dialogue mentor text you’ve shared. I really appreciate your dedication to keeping an updated, ongoing list of our favorite picture book picks. What a caring commitment you’ve made. Thank you, thank you. Happy Easter!